This is, perhaps, the most chilling book I’ve read this year. Out of over 130 books, that’s saying a lot. 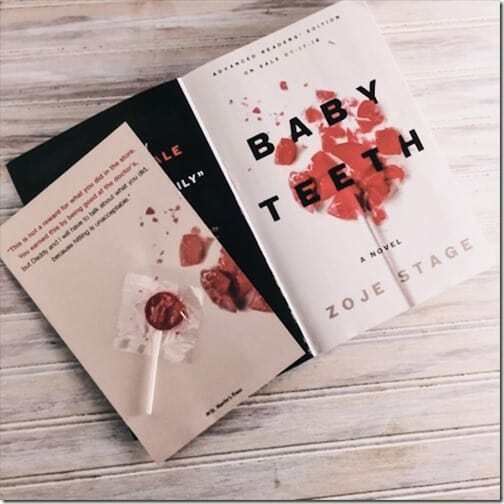 In Baby Teeth by Zoje Stage, Hannah is the seven-year old child of Suzette and Alex and she is a true sociopath. She spends her time devoted to making her mother miserable and pitting her against her father, whom she adores. It’s a dual point-of-view between Suzette and Hannah. From the first page, I was hooked on Hannah’s thoughts and actions towards her mother and others she deemed unworthy of her attention. We are taken on a ride through Suzette’s destructive thoughts before Hannah’s birth, Alex’s apparent cluelessness and zero desire to look beneath the façade, and Hannah’s violent actions without remorse to follow. At times, it was excruciatingly painful to read the words describing the frustration and abuse from Suzette. You could feel the overwhelming helplessness when she tried to talk to Alex or when she tried to find a school to help Hannah. It was equally disturbing to read about Hannah’s desire to remove her mother from the picture. She wanted her father to herself and seemed to escalate her actions from annoying to dangerous. This is a book about a seriously dysfunctional family and I found it quite thought-provoking, weeks after reading it. Also, I’m a kindergarten teacher and I had all my kindergarten teacher hats on while reading this book. I’ve read some reviews from people who believe a child of age 7 cannot be so mentally unstable to the point of antisocial personality disorders. I beg to differ. I’ve experienced children younger than age 7 with severe psychopathic and sociopathic traits. I’ve also experienced extremely gifted children with a very advanced vocabulary. I could absolutely believe Hannah was capable of her thoughts an actions. I received this book from the publisher in exchange for my honest opinion.